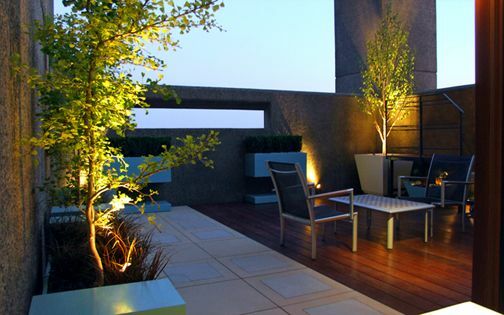 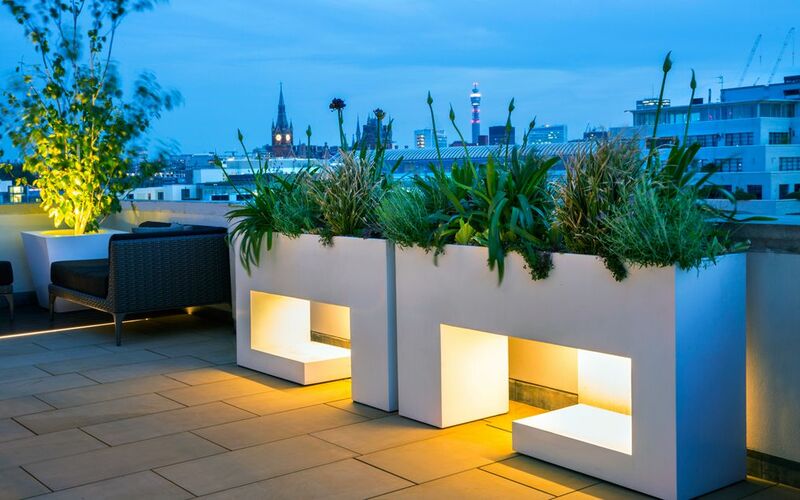 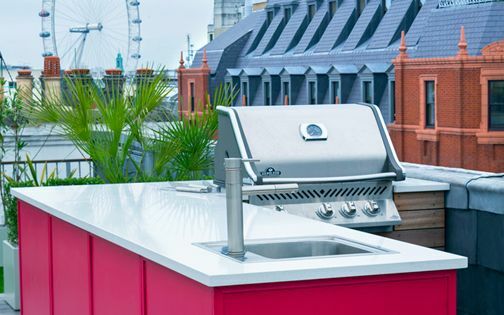 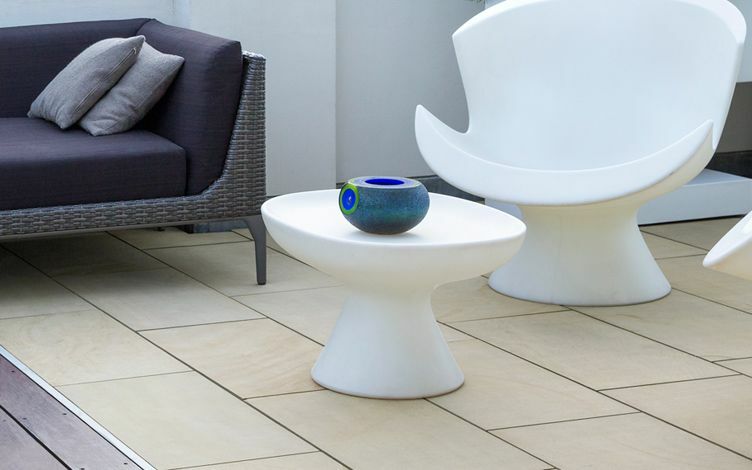 This contemporary penthouse roof terrace is defined by a central focal point formed with a pair of geometric custom troughs, amid a symmetrical composition. 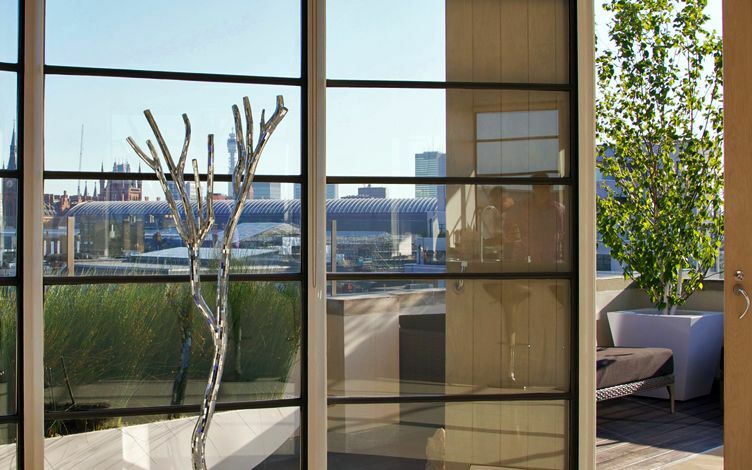 A minimalist white palette produces a fluid interplay, keyed into the apartment's decor and surrounding modern waterfront architecture. 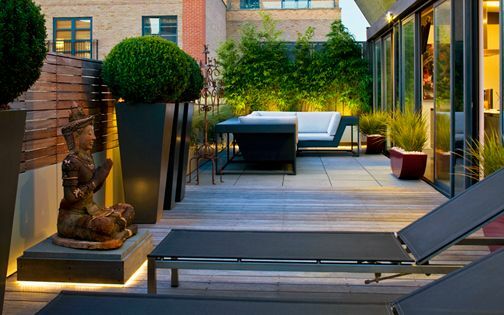 Sandstone, hardwood and LED lighting merge with a King's Cross city landscape, where Silver birch trees frame a St Pancras vista, while silky grasses generate soft cascading textures. 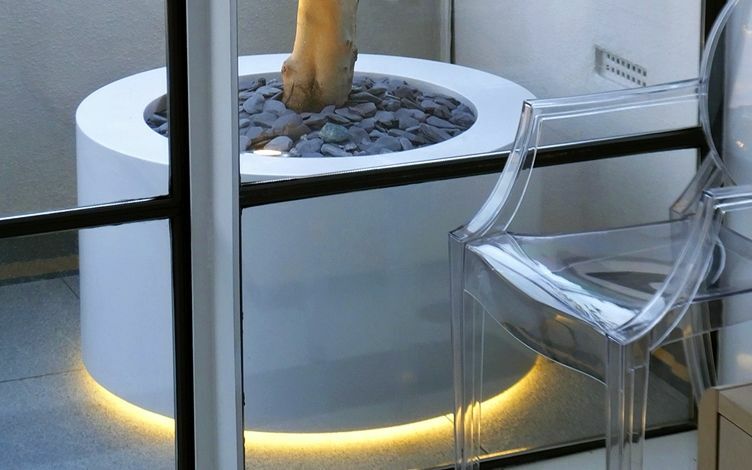 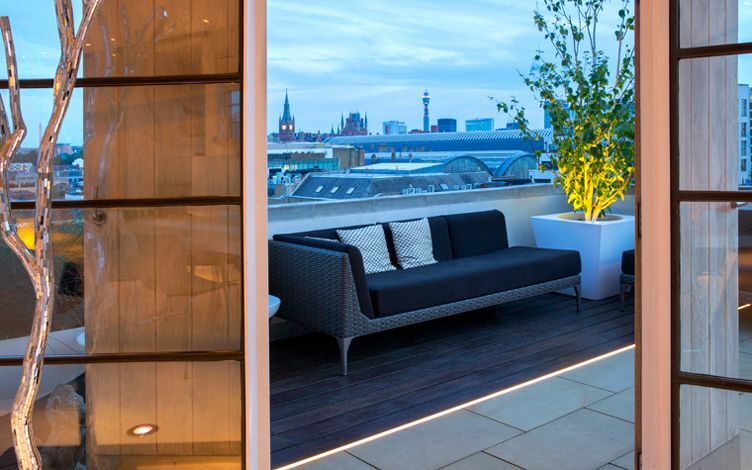 The penthouse atop Albert Dock features a minimalist apartment, where its designer rooftop fuses with our clients' distinctive visual approach by utilising light sandstone pavers, custom-made planters and sleek LED lighting which form a contemporary, luxurious layout. 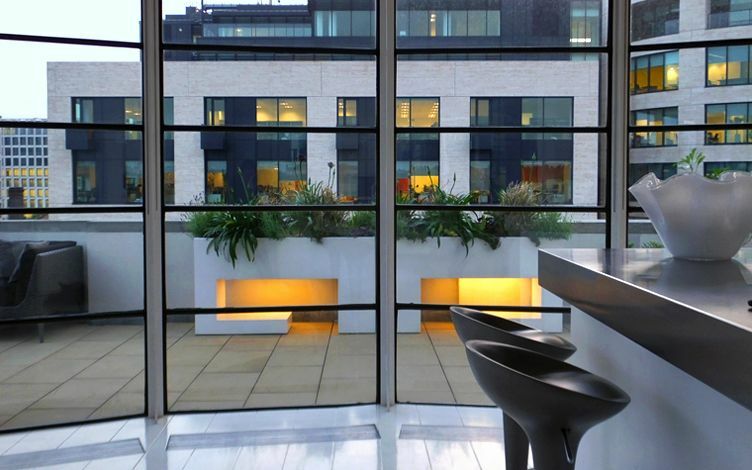 The roof terrace design's mellow textures key into Kings Place, the innovative concert hall across Regent's Canal Battlebridge Basin and its curvilinear stone-clad facade, while a dynamic interplay between this landmark's modern architecture and the apartment's Art Deco elements is enhanced by white geometric planters. 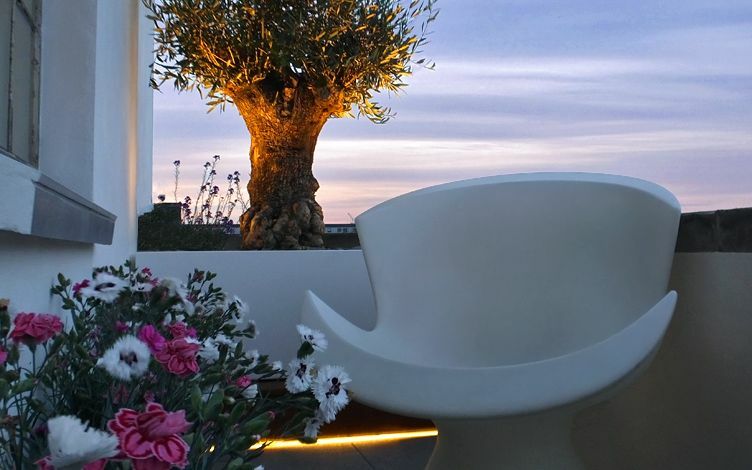 With the outdoor space atmospherically lit, the sun setting above the canal heightens roof terrace garden ambience, amid unadulterated city panoramas. 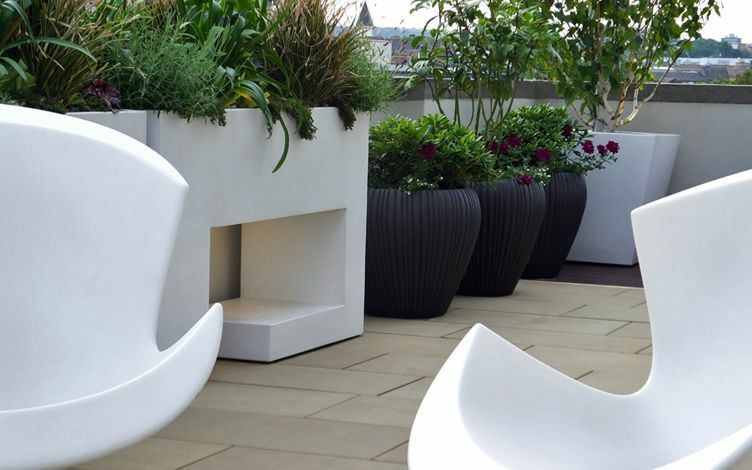 The central planters' geometry is softened with silky foliage, while a duo of boatlike, 2-metre curved vases flanks the roof terrace outline. 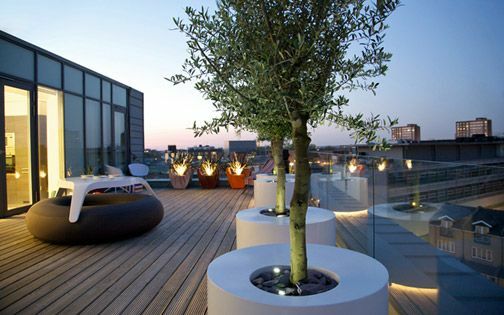 These streamlined planting vessels reiterate the living room's circular elevation, which curves through this penthouse terrace. 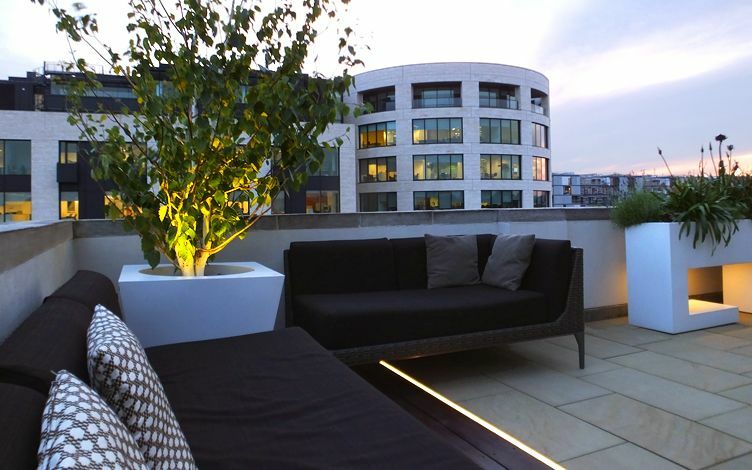 Contemporary, cosy sofas accommodate picturesque London sunsets and a sweeping Shard panorama, positioned along a hardwood deck, where bespoke, Silver birch tree planters feature a spherical top to echo the terminal arches of St Pancras. 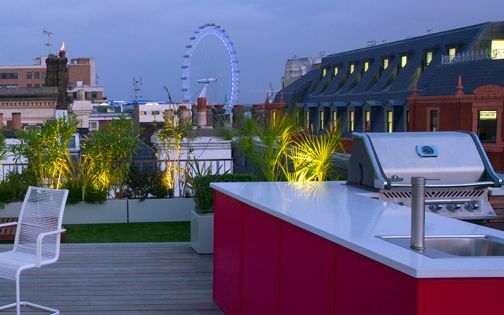 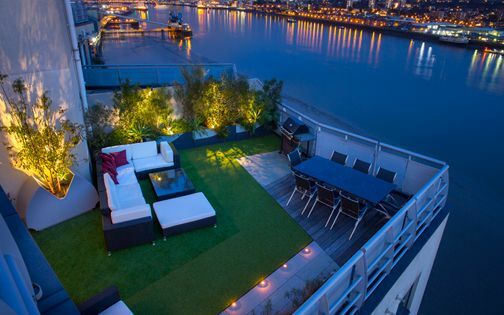 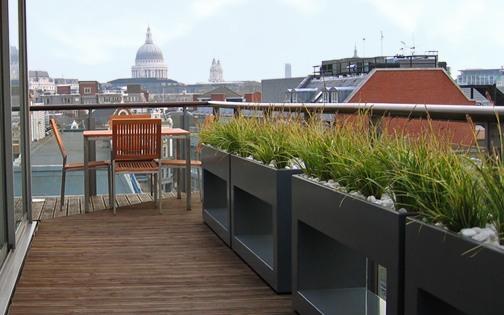 We continually evolve distinct apertures in roof terrace designs to expand depth towards urban skyline perspectives, beside hydrodynamic planter shapes which highlight the presence of nearby watercourses, and delineate garden designer nuances amid an intrinsic, metropolitan landscape across its citified outdoor lifestyle. 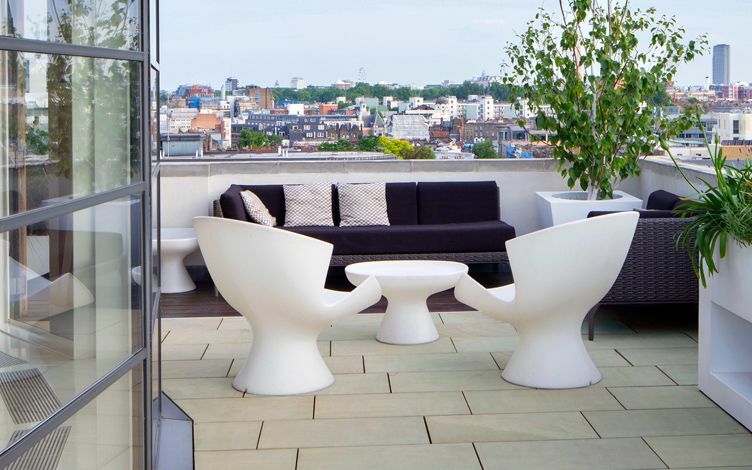 An expansive view from the penthouse's open-plan kitchen highlights the roof terrace design's fluidity and interlinked elements. 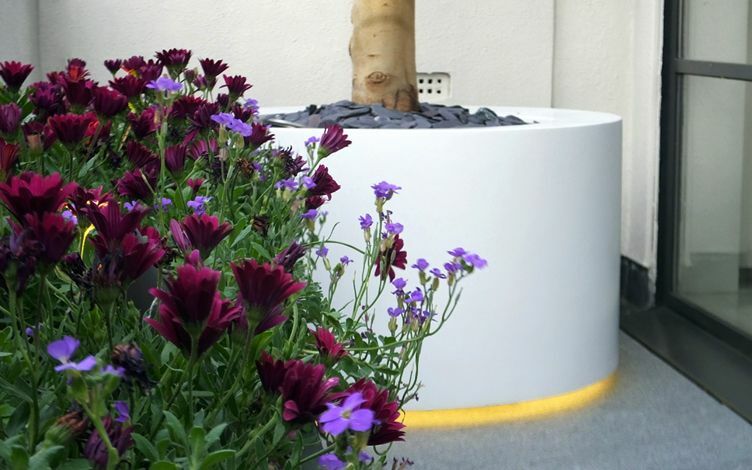 The white large-scale planters replicate the concert hall's prodigious outline to form a centred focal point, and emulate the indoor flooring's colour. 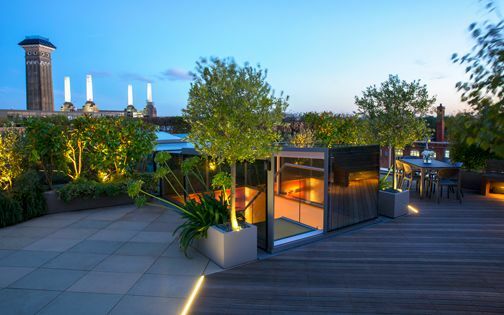 The kitchen's worktop profile, planters' architectural detail design and canal-side buildings meld together, while interior sculpture and Silver birch trees interconnect to form an indoor-outdoor design sequence. 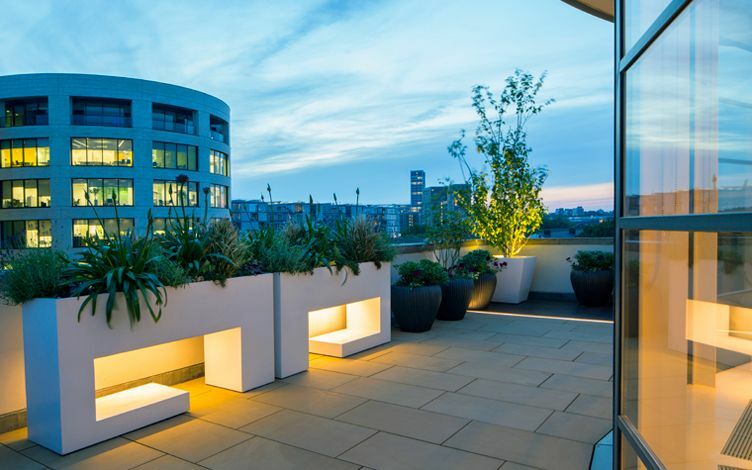 LED strip lights merge with a voluminous, full-height glazed elevation; their pure linearity expands an urban vista towards the King's Cross skyline, where minimal upkeep throughout hard and soft landscaping schemes conveys a contemporary penthouse roof terrace lifestyle. 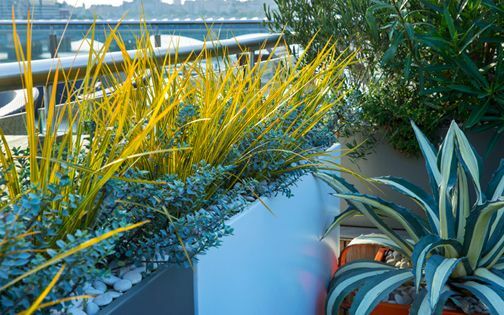 We returned a while later to design a smaller roof terrace, where its south-facing aspect provides sun and shelter which sustain a thriving Mediterranean rooftop setting. 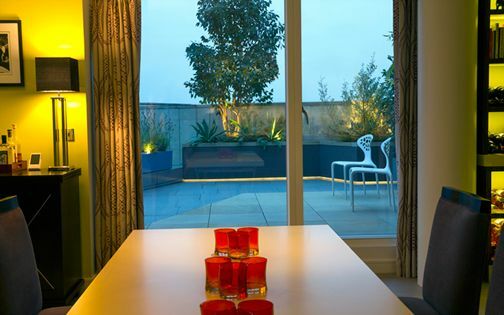 Since our clients' holiday home is in Barcelona, North-eastern Spain, we planted befitting Olive specimens, vibrant Cape daisies and emblematic, scented Carnations to suit the master bedroom's ambience. 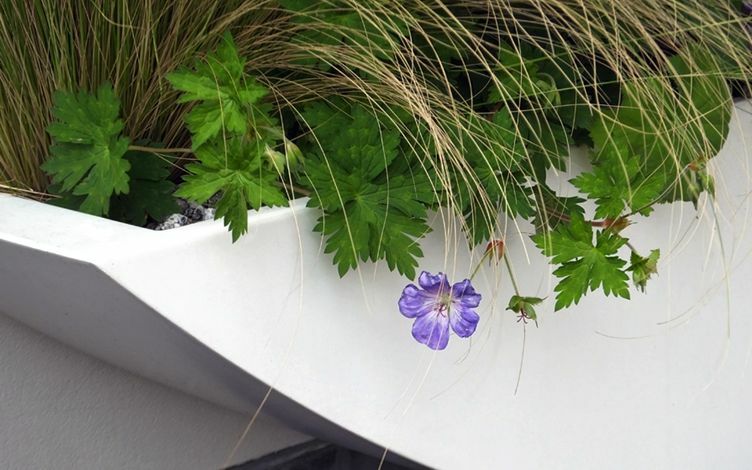 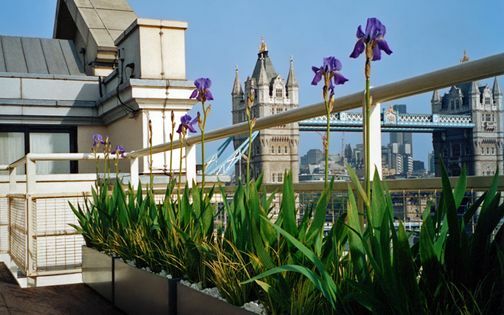 Culinary herbs and alpines, featured in a bespoke trough fitted onto the terrace's parapet wall, produce edible foliage and blooms – teeming with essential wildlife. 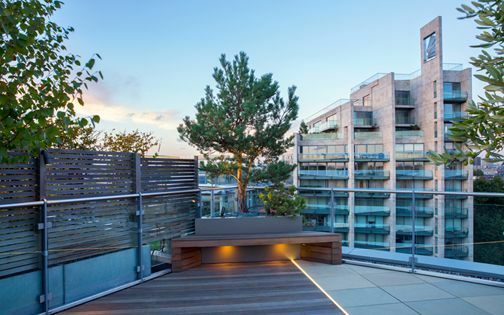 A tall Olive tree trunk echoes its Shard backdrop, enhancing and linking this tiny, 11-square-metre terrace balcony to a panoramic city landscape.